Edward Oatley started farming part-time after World War I having served in the Lifeguards through that war. By the early 1920's he was full-time dairy farming and poultry breeding. In 1924 he won his first gold medals in county and national laying trials - the measure of excellence in laying poultry at that time. By the 1930's the commercial poultry breeding business was well established with poultry and chick production rising rapidly to the outbreak of World War II in 1939. In 1947 the farming business moved to nearby Paxcroft Farm, starting a pedigree Friesian dairy herd, soon to become a leading herd in the county, and raising chick production to over 500,000 annually. The 1960' saw major changes in the poultry industry with the introduction of Hybrid layers from multinational organization. The Oatley Family at Paxcroft Farm changed to commercial egg production and cereal farming. This became the pattern for the future- integrating livestock and egg production with home produced cereals via high quality farm mixed feeds, and using organic manures to maintain healthy and productive soils; with a good agricultural balance. Today's laying stock continues to produce over 15 million eggs each year. Fresh, quality eggs of the very highest standard, and the Oatley Family remain totally committed to Farming excellence. As you can see this is a 100% vegetarian diet. In nature the chicken is an omnivore, and an ideal diet would include some animal protein such as fishmeal. However, pressure from the major retailers and consumer groups has meant we no longer use animal proteins. Homegrown cereals make up the bulk of the diet. These are ground to aid digestibility. Soya is added as a necessary source of protein, and soya oil is a good source of essential fatty acids as well as energy. Limestone granules provide the high level of calcium required by laying hens, not only for strong shells, but also to provide strong bone structure. A supplement of vitamins and minerals is also added. Sample numbers of our hens are weighed every week, and diets are formulated on computer for every flock, according to its needs. If we humans had as well a balanced diet as our hens, we would all be very healthy indeed. Eggs have had an undeservedly poor reputation since the early 1980's. Firstly there was the cholesterol issue. Medical opinion at that time was that eggs, being a source of cholesterol were a potential hazard to health. More recent research, both in the UK and in the USA has proven that dietary intake of cholesterol has very little impact on our blood cholesterol, and most of us can happily eat eggs without any problems Back in the eighties, the weekly recommended intake of eggs was 3 per person. This has now been revised to 6 eggs per person, but sadly doctors are still relying on 20-year-old advice. Then, of course, there was the salmonella scare of 1988. Once again there has never been any real evidence of a link between eating eggs and salmonella, but the media conducted such a campaign against eggs at the time, that the two are now inextricably linked. To the egg industry's credit, it did make every effort to clean up its act at that time, to the extent that the Food Standard Agency has stated that the egg industry is light years ahead of the rest of the primary food industry in its food safety assurance schemes. In this, it was referring to the "LAID IN BRITAIN" and the "LION" safety assurance schemes. The "Lion" scheme is well documented, and widely advertised. It relies on a hygiene programme, backed up by the fact that all laying hens are vaccinated against Salmonella Enteriditis and Salmonella Typhermurium, the two strains associated with eggs and human food poisoning. 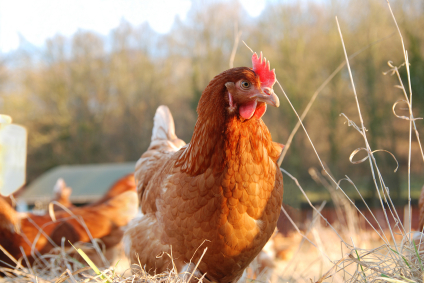 The "Laid in Britain" scheme is less well known, as it is the one adopted by the smaller, independent egg producers in the UK, who supply the independent retail sector, rather than the big supermarket groups. While it adopts very similar hygiene codes of practice to the Lion scheme, it stands apart from it through the use of "competitive exclusion"
Rather than vaccination. In nature, the newly hatched chick is in close contact with its mother, and in the first few days it acquires its mothers gut flora. i.e. it develops a gut content similar to its mothers, which would be pathogen free, and would line its stomach wall, preventing the invasion of harmful pathogens such as E.Coli and salmonella. With modern agriculture, this does not happen, as the newly hatched chick comes out of an incubator and never comes into contact with its parent. Under the Laid in Britain scheme an adult gut flora, cultivated from a special flock of pathogen free chickens, is given to the day old chick, and again when the bird comes in to lay. Trials have proven this system to be extremely effective in warding of salmonella as well as a whole range of invasive pathogens. To reinforce the safety aspect, laying hens under this scheme are blood tested for the presence of salmonella. It is this "belt and braces" scheme, along with its welfare friendly aspects that we have adopted at Paxcroft farm. Since 1988, we have produced and sold over 150 million eggs. During that time we have not been implicated in any food poisoning incidents. We firmly believe that eggs are one of the safest, and one of the most nutritious natural food products available. Paxcroft Farm Eggs are distributed throughout Wiltshire and the South-West, catering for all customers from the largest retailers to small corner shops. They are also available from our own Farm Shops. While Paxcroft brand name enjoys the highest reputation for quality and freshness, egg packing is also undertaken for customers with their own brand identity. Pack sizes include: 6, 10, 12, 15, 18, 20, 24 and 30 egg quantities, and are available in a variety of materials to suit the requirements of the retailers. Freedom Food Free Range Eggs are also available in traditional 6 egg packs only. Meet or exceed all industry codes of practice for animal welfare. Meet or exceed standards or Government codes of practice for air, water and soil. Meet or exceed existing and proposed standards for both pollution and nitrate controls. Produce free range eggs under Freedom Foods (RSPCA) rules. Use only specially formulated home mixed animal feeds, using home grown cereals and enhanced levels of vitamins, minerals and polyunsaturated oils - under British Pharmaceutical Society production rules. Use Poultry that are vaccinated against all common diseases, that are monitored by blood testing, and checked and inspected regularly by a specialist poultry veterinary surgeon. Check all animal feeds regularly for absence of harmful bacteria (including Salmonella). Paxcroft farm is a member of L.E.A.F. (Linking Environment and Farming), and uses L.E.A.F standards for environmental audit. When you next go shopping for eggs in your independent food store, make sure that you choose the packs displaying this emblem. This is your guarantee that the eggs are produces on local farms who comply with the 'Laid in Britain' Quality Assurance Scheme. This Scheme demands a thorough testing and monitoring program designed to maintain the health and welfare of laying hens. It is aimed at controlling all Salmonellas, E.Coli and other organisms. The recent Government announcement that 'British egg-laying flocks are now the healthiest in the world' means that eggs can be eaten and enjoyed with renewed confidence. You can play your part too, by making sure that eggs are stored in the refrigerator until you want to cook them. Keep your kitchen work surfaces clean when preparing meals and wash your hands between handling different ingredients. Eggs are an important source of nutrients essential to healthy eating, and growth. They provide protein for body building are repair, fats and traces of carbohydrates for energy and growth, vitamins to regulate body processes and wide range of minerals which help to control body systems or are needed for body structure. Although eggs are high in protein, they are comparatively low in calories, which means they are an excellent food for weight watchers. Not only do eggs taste good, but they can be served in dozens of different ways - boiled, scrambled, poached or made into omeletts. There are many delicious meals with eggs which are quick and inexpensive to prepare. From Breakfast to bedtime, on schooldays and holidays, weekdays and weekends, eggs make cracking meals for today's busy lifestyle.